Everything now has a password. I may have started when the first answering machines came out that let you call home and get your messages remotely. You would call your number and when the message came on you could hit a key which would prompt you for your passcode then listen to the messages people left for you. Since then passwords have gone crazy. Every website needs not just a password, but also a username. Some people have tricks to remember what their login info is, but most don’t. Instead, they just use the same combination on EVERY website! That’s not really a problem unless someone (a friend or a hacker) figures out your info. Of course lots of people think they’re smart by creating a Word or Excel document that has all of their information – this is even worse than using the same password for everything. If the file get corrupt or stolen or accidentally deleted, you’re screwed. I happen to use many various and random passwords. For many websites I can remember the user/pass combination, but I deal with many more websites than most people and because of all of the clients I work with I have their usernames, passwords, emails and other information. There is NO WAY I could keep track of all of that information without some form of master list. THEN the problem is trying to keep it secure. The answer is simple: KeePass. 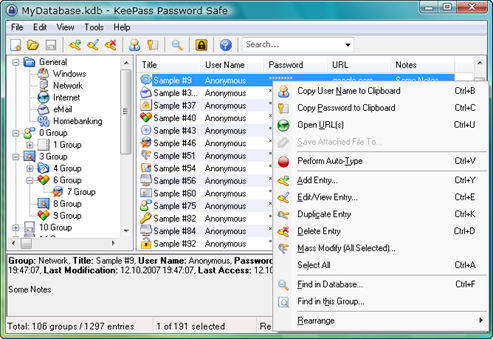 I’ve been using KeePass since about 2005 after someone suggested it to me. There’s even a version for your Android phone so you can always have your passwords with you. One password to get in, then you have access to all of your other information. I even keep all of the information from my wallet in it so that I don’t have to grab my wallet when buying online. I have a record in the KeePass database for each one of my credit/debit card, including the number, expiration date, security code and even the phone number on the card incase I lose my wallet. Best of all, the .kdb file gets backed up by your Carbonite subscription (yeah, if you don’t know what that is, click the link and email me). If you’ve gotten this far, DOWNLOAD AND INSTALL KEEPASS!